While alot of reviews are placed online some people write to us or publish articles to tell us how much they enjoy their Ultraskiff. We try to post those reviews on this page. At the bottom of the page are some Video Reviews people have made. Here is a Link to the most recent review article that someone wrote in Australia. Feel free to contact Tom @ tsargent55@gmail.com. He said he would not mind answering any questions. Tom Sargent (myself) has been an avid fisherman since boyhood, having fished countless streams and lakes from northern Vermont, the Southeast and Mid-West. The lesson he learned in his early years, that fishing is a fun way to get away from what he should be doing, has continually served him well into his 60’s. Sargent is the former CEO and managing editor of Fishbyte.net, an e-zine based in North Carolina, that covered fishing tournaments and the activities of over 80 fishing clubs across that state. I like fishing. When I was young, all I needed was my bicycle to get to a favorite stretch of river, my fishing rod and a few hooks, and a can of worms to ply a few trout out of the waters. I’d wander up and down the banks of one or two trout streams within cycling distance from home, wade through the waters when necessary, and use my allowance to replace the hooks and occasional Mepps spinner I lost to a snag. But, as I grew older, fishing became more complicated and I began to require ways to get out on the water. Maybe it was the years of listening to boat motors, paying registration fees and maintenance costs on larger boats and trailers, or mowing grass around boat trailers parked in the yard. I found myself wanting to uncomplicated things when I was getting away from what I should be doing. I didn’t have the storage space; I was looking for a bit more solitude, and I didn’t need as much gear and accessories. What I was looking for was a return to the peaceful wandering up and down a Vermont stream, but out on the open waters of my fishing adulthood. I turned to fishing from kayaks. A number of fishing kayaks have passed through my garage. A few Ascend models, including the FS 128T Sit-on-Top, and a Field & Stream Eagle Talon never provided me with all the pieces I needed. As I tried various kayaks looking to find the right blend, I found that adding one feature often compromised another. This last year I happened to stumble across some information about the Ultraskiff 360. It looked like it might answer many of the failings presented by fishing from a kayak. So I took a leap of faith, took delivery on my first Ultraskiff over the winter, and have logged a good number of Spring hours fishing from it. What follows is a look at my fishing experience requirements and then a comparison of how those needs are met or not met while fishing from the Ultraskiff or a kayak. First, let’s be clear… I am not a young angler anymore. This article is written from the perspective of a 62 year old man whose muscles both complain a bit more and can’t possibly do what they did 20 years ago. And, at 6 foot, I’m now 60 pounds over my youthful 180 pound carrying weight. A fifty pound bag of dog food presents no strength issues, but anything over 100 makes me pause to find an alternate way or a partner to move it. Thus, a first requirement in a fishing vessel is the overall weight and ease in moving it. My back has complained about certain movements since my mid-20’s. I had no problems throwing hay bales in my younger years, and one-at-a-time is still not a problem. It’s the twisting motion at the waist that creates problems. And, if I remain in a twisted position for any length of time, I am sure to need the help of pain meds the next day. A second need when fishing is to be able to face, squarely, the area to which I want to cast. This function eliminates any twisting that can make the day after a nightmare. My third need has to do with staying dry. I love being on the water and like to avoid suddenly being in it. I always wear my floatation gear and swam like a fish in my earlier years, but nowadays I work carefully to remain above the waves. And, I don’t like the idea of my fishing gear either staring up at me through 10 to 20 feet of water or floating away from me in all directions. Stability of the craft is an essential need. When scanning a potential fishing hole, there is a specific vantage point that works best for me. I like to be as high above it as I can. This is my fourth requirement. If the water is at all clear, I can peer down into it and see structure better. Depending on the bait type I am using, I might prefer standing up. I am more accurate on long casts when I’m not sitting down. During 30 minutes of fishing time, I’m apt to pop up and down a couple dozen times. An advantage for me in doing so is overall body comfort over a half day of fishing. I need to be able to occasionally stretch the muscles and back. Finally, I like my gear and I like to be able to get to it easily while fishing. I don’t mind an extra trip or two back to the truck to haul a small, soft cooler or a gadget or two down to the water. But, it all needs to be available to me when I need it when out on the water. This is my fifth and last requirement… I like my little gear toys and comfort items onboard and I want them when I want them. So, how does the Ultraskiff 360 or kayak answer these five requirements? Just a few hours out on my new round boat has provided many of the comparison answers. While the overall weight of the average kayak is somewhere in the range of 50 pounds, its form is not as easy to lift and carry as that bag of dog food. The FS 128T that provided me a more comfortable seating position above the water weighs in at 74 pounds. I’m never going to lift the Ultraskiff, as it comes in at 123. Fifty pounds I could lift up onto a roof rack, but needed to do it one end at a time because of the length pf the weight. The FS 128T was a good trade-up to traditional kayak fishing in terms of stability and seating position, but the added heft made it mandatory to use the back of my pickup truck. I had already given up on the roof rack, so rolling the Ultraskiff up to the tailgate and lifting it from one side up into the bed is like lifting that bag of dog food. For most of the locations where I fish, I can back the truck to the water’s edge. Unloading there is as simple as sliding the boat off the truck and onto the ground. I’ve found the Ultraskiff can be rolled with reasonable ease (it takes some getting used to) when there’s distance between water and truck. In those cases I find it physically easier to roll my Ultraskiff than carry a kayak. The dolly that can be purchased for the 128T is great once you have it attached, but it’s not an easy task to do so for one person. When it comes to how the overall weight of these craft impacts maneuvering and transporting them, score one for the Ultraskiff. This is an easy one to award. The adjustable height, pedestal seat I have mounted on the Ultraskiff gives me 360 degrees of swivel. No matter how the vessel drifts, I can swivel to square away to cast in any direction rather than twist. Even the sit-on-top kayaks like the hybrid 128T that are equipped with swivel seats can’t give you that. Just a few degrees left or right and you run out of deck to put your feet. And, as you swivel left or right on that kayak, stability becomes worrisome. What I disliked most about fishing from a kayak was the range of the cast field available to me. At best, I had about 90 degrees of water that I could throw a bait to. Without twisting and risking my back comfort, that casting field was more like 45 degrees. Throw in a light breeze or a bit of a current and it is nearly impossible to keep your fishing target within those 45 degrees. A couple of casts and the rod goes into the holder, you pick up the paddle with two hands, and re-maneuver into position. Getting a couple dozen casts on a hole means not fishing half of the time. I am a fan of using a paddle rather than any motor; it’s less gear to haul to the lake and provides some exercise I need. But, when I have to use two hands to reposition the boat, I am not fishing. With the 55 pound thrust trolling motor on my Ultraskiff, I can reach down with one hand and easily move back to position while fishing with the other hand. After the first half-day on the water, I was performing this maneuver without ever taking my eyes off the water. Kayak and canoe technology has come a long ways since my early days, and the FS 128T is probably the best example in stability on these floats I have experienced. There’s a reason they nicknamed this kayak model “the barge”. Getting on and off any sit-on-top kayak is a whole lot easier for a man of my age and muscle tone. However, that stability came at the price of maneuverability. Long and wide is what creates less rock and roll in a kayak or canoe, and that means no quick turns and a “bless your heart” if there’s a stiff current or wind. Once that bow comes around it’s a real workout getting it pointed back in the right direction. Stability in the Ultraskiff is not a question. Maneuverability remains on-a-dime. The first time I stood up onboard, I did so slowly and carefully, a reflection of a couple experiences trying to do so on craft that promised a good experience when doing so (only to take a solid dunking). It didn’t move. I slowly moved my 240 pounds out closer to the edge expecting the deck behind me to rise up and dump me forward. It didn’t happen and nothing rolled off into the water. It was no different than standing on any of the swimming docks I had jumped off during my youth. You intentionally got off or someone helped you do so. As the first afternoon rolled along, I realized I wasn’t even thinking about my ups and downs on deck. I came on and off the seat repeatedly and knelt on deck to get items out of the storage compartments without thinking about stability. All my physical movements on a kayak were always guarded. Score another big point for the Ultraskiff. Its stability and maneuverability is, without question, better than any kayak I have been in and I don’t worry about staying dry. Obviously, my discussion about stability above speaks volumes about the ability to stand upright on a fishing boat. I always loved standing up near the bow of my old bass fishing boat, using just a foot to steer my way to nearby docks or underwater structure. Some kayaks provide the paddler a rope to hoist themselves up out of their seat in order to stand. In my mind that was a recipe for a watery disaster. It’s a whole lot easier to just stand up when you want to… and sit down again. If I needed a rope to stand up successfully, the image I have in mind of my trying to sit back down is, well, rather comical while I’m sitting here at my desk. 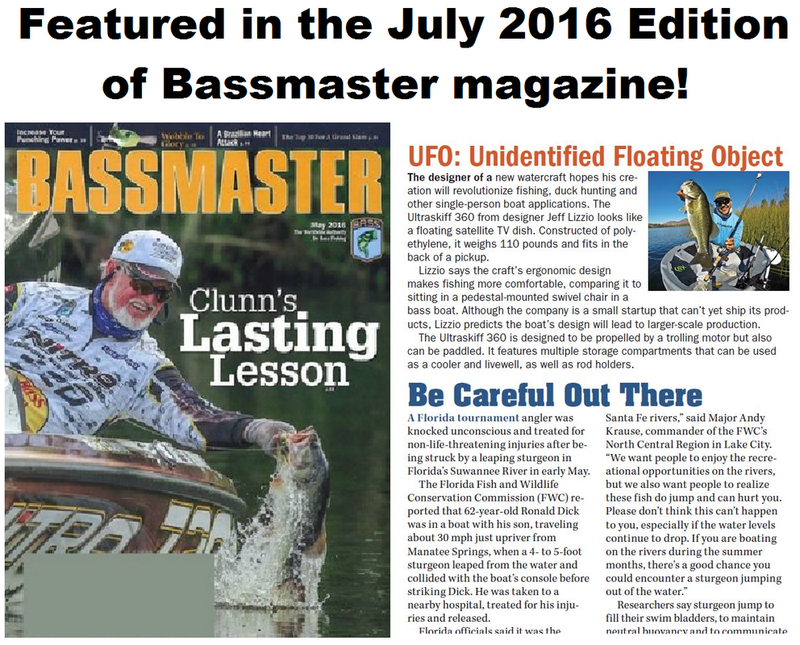 What I learned from the bass boat fishing days is that I loved to be that far above the water. I felt like I could see better into the water and I know my casting is more accurate when upright. After every outing in a kayak, I fought off discomfort in my legs and back throughout the day. I could only change position just so much and, on some days, had to come off the lake just to stretch and rejuvenate the muscles for a bit. There was always a reasonable chance I would be reminded the next day of my activities. Again, the Ultraskiff 360 has to be scored head and shoulders above a kayak on this upright requirement. I am up and down, moving around all day, so cramped muscles are never an issue. I feel like I am moving all day, yet can relax in a seated positon to enjoy a sandwich or drink from the cooler. I always had to be pretty particular about what I could and could not carry with me while on a kayak. Even the 12 foot “barge” with it’s under-deck storage compartments only provided just so many cubic feet for the things I might need while on the water. After a trip or two on that hybrid, I learned to keep what was most-important to me, or what I used the most, within easy reaching distance. Body maneuvering for me in a sit-on-top kayak is not an easy experiment and always comes with fairly poor odds of success. While I could store a bunch of toys and gadgets way down deck in one of the compartments in the FS128T, getting to it and back was risky. In a traditional kayak about my only option was to tie it on back or on front of the vessel. Getting to it while staying dry was impossible. I’d have to beach first in order to get to it. If I put something in my lap, inevitably it would slide into the front of the kayak. What I could take with me became very limited. I found I was even leaving what could be needed fishing gear behind. I was quite surprised at how large the three compartments are in the Ultraskiff when I first opened one. Although there are a bunch of videos out there showing every movement this round craft could make, I hadn’t seen one that highlighted the storage capability. Yes, I saw how someone made one of the compartments into a livewell… I just assumed it wasn’t a very big one (and, I admit, I’m a catch and release immediately, so I didn’t pay too much attention). The Ultraskiff 360 won this final requirement award the first time I laid the boat down in my garage and began figuring out where I’d place my stuff on/in it. I can store the essential fishing items and baits in the front compartment, while leaving another to boating gear and the third to, well, I haven’t figured that out yet! My rod holder attached to the back of my seat includes a lower rack to hold my soft cooler below, so it’s never in the way when I move around on deck. 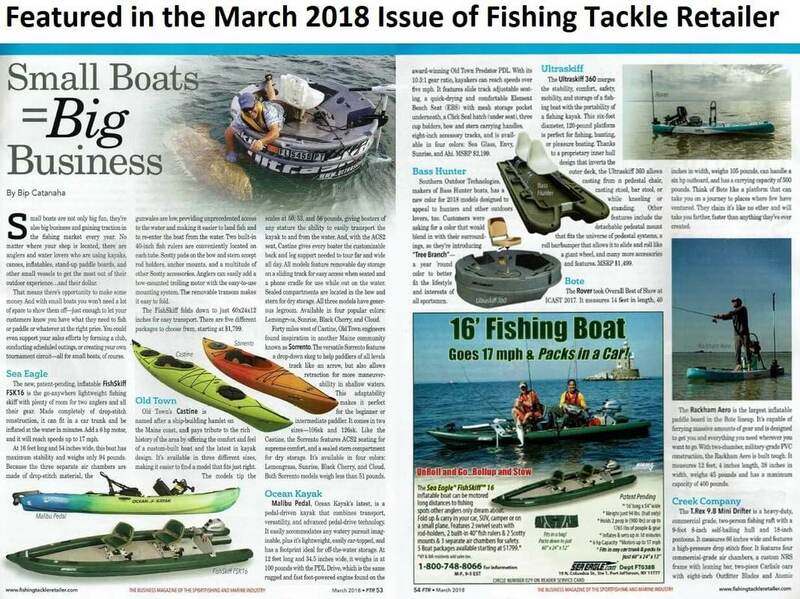 There are a lot of kayak fishermen out there and I’m so pleased to see how the interest in fishing in this manner is growing. Too many of us are giving up on regular fishing excursions, though, because it’s so difficult to get in and out of a kayak, we worry about stability and losing gear, or it’s just too much of a struggle to stay on hole and fish like we want to. We don’t want to spend the money on a bass boat or deep v-hull, and especially don’t want to deal with the maintenance and storage costs and issues. If you get a chance and can try out the Ultraskiff 360, don’t pass it up. You’ll be surprised at how well it tracks across the water, the speed it gets you there (with a 55 pound thrust), and how much better the fishing experience is as compared to your kayak outings. You’ll spend a few more dollars than the average kayak or canoe, but it’s worth it when it means you can upgrade your experiences so dramatically. If you are fishing from a kayak and are still not quite happy with it, think about your requirements. Your current float is not meeting some of them. It might not be a deal breaker yet, but an improvement sure would be nice. Turning a “what could have been” fishing outing into a great day on the water is probably just an Ultraskiff 360 ownership away. I have to tell you that the ultraskiff exceeded my expectations. First let me start by telling you that I am not a small guy. I'm 6'1" 285lbs. I took the ultraskiff out for the first time this past Saturday to a fairly good sized lake up in the Cascade mountains. Which wasn't the best day for a test run. We had 6 to 8mph sustained winds, with gust up to 20mph and heavy rainfall and some hail at times. When I first launched I figured I'd go out for a few minutes and see how it handled and call it a day. Well 6 1/2 hours later I was still fishing. The stability in rough weather and pretty big waves was amazing! I never felt uncomfortable or was I worried about capsizing or falling off. Now I was definitely a little cold ( my fault ). I managed to hook into a few good sized largemouth, which was a bonus. After calling it a day, I literally spent an hour at the boat launch talking about the ultraskiff and showing it to other fisherman. You have an amazing product! I will defiantly give it nothing but praise when talking with others. My Ultraskiff performed as advertised… Even managed to catch a couple Calico bass. Very stable and produced a lot of attention. There is a learning curve associated with loading/unloading from my truck but I was able to do it alone. A little less than easy but doable. Overall A+. Spent 5 hours on one 27dc battery with some juice leftover, with Minn Kota 55 Riptide. Keep doin what your doin..You have a great product. If I get down to your neck of the woods I’ll look you up. > The way to really go fish and camp! Best boat ever, thanks for a great product! ​My name is Paul Presson, I am a disabled veteran (Desert Storm, Special Operations). I have severe lower back problems and a muscular disease that has curtailed a good majority of my saltwater fishing. 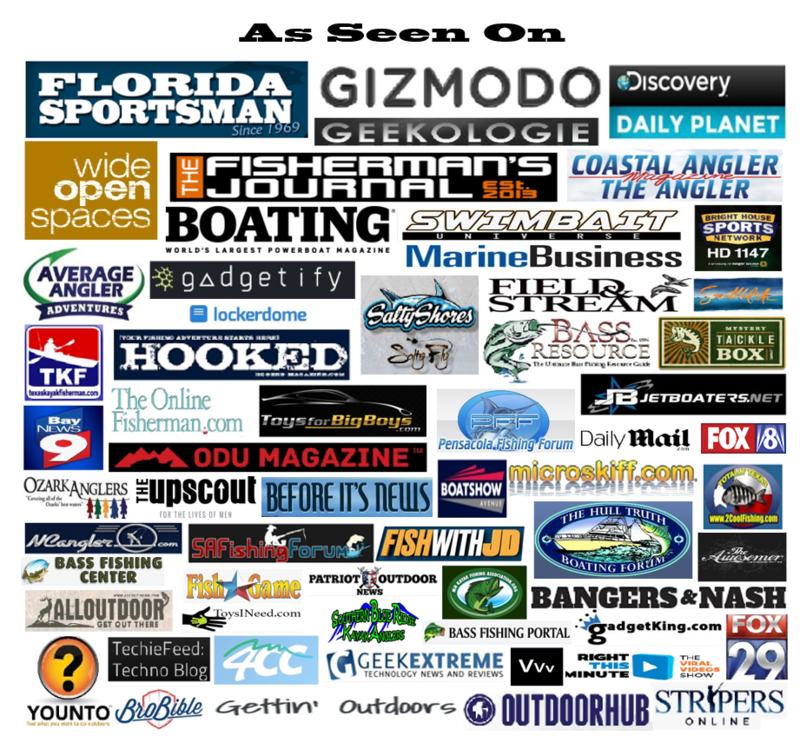 I have written fishing articles for international, national, and statewide publications. After seeing an Ultraskiff 360 advertisement, I decided to contact Jeff Lizzio, owner and creator of this unique, little skiff.. Being a long time kayak angler, I was afraid that due to my physical limitations, I would not be able to comfortably fish out of the Ultraskiff 360. Recently, I was invited out to fish with Jeff Lizzio, owner and inventor of the Ultraskiff 360. I jumped on the chance with no hesitation. Once I began researching this strange creation, I was skeptical to say the least. I promised myself, I would go into this ordeal with an open mind and give it a chance. I was actually worried that I would go out with Jeff and then have nothing but negative things to say or write about his skiff. When Jeff and I met at the launch area, both of the Ultraskiffs were setup and ready to “roll”. This initially made me suspicious that maybe he did not want me to see the difficulty unloading and unloading the boats from the back of his truck. I also was very conscience of where we were launching and going to fish. I suspected he was going to keep us in a secluded (wind free) area. I collected my gear, Jeff gave me a five minute “how to” course and we were on the water. Let the test begin. With three large compartments, all the gear I use for a full day of kayak fishing fit with room to spare. I brought three fishing rods and with the fishing rod holders behind the pedestal chair and the flush mounted holders on the boat, I could have easily brought more. My first big test, in which I thought I was going to be checking the “fail box” was boarding the skiff. To my surprise, it was a piece of cake, climbing in from a foot of water, I placed my knees over the gunwales and slid right into the chair. We were on our way. The ultraskiff I used that day was equipped with a trolling motor, two batteries, safety gear, a mounted Go Pro, and an anchor. I have used trolling motors for 25 years, but I thought this was going to be difficult because of the shape of the skiff (gonna go round in circles). It took me all of five minutes to effortlessly steer the boat, another hurdle I did not think this boat could jump. After observing me for a short period of time to make sure I had a handle on his creation, he set me free. We immediately set out for open water, another theory of mine out the window. The pedestal seat was very comfortable and unbelievably stable. As I started fishing, my initial trepidation of standing, kneeling, or any maneuvering was put to ease immediately. All of my tackle, water shoes, and bag cooler were incredibly easy to get to. The skiff has four large cup holders, I used them all for beverages, artificial baits and tools. This created a clutter free environment and easy access. As I fished, steering was a breeze and with 4 nylon cleats, anchoring was no problem whatsoever. Another test was about to happen, I am not the most graceful person by any means. I was fairly sure that the first time I set the hook on a fish, I was going to eject myself. Not only did I not, but catching fish from the skiff was easier than any kayak I had ever fished out of. This is due to great designing. The inclining outer deck and the flare and prow work in harmony with a shock absorbing, detachable seating system and a lowered transom. Trout after Trout, if I could not release without touching them, I would bend over and wet my hands to preserve the fish with absolutely no tipping. We fished for over six hours, the winds had kicked up to 15mph plus, this was the true test. With the combination of six skegs, the flare and prow, and the weight distribution design, the boat tracked great. We anchored the skiffs at a spoil island, stretched our legs and had lunch. At this point in our journey, I realized I didn't even have “yak back”, my whole body was feeling really good. As we returned to the launch, the winds were even worse, whitecaps everywhere. The Ultraskiff handled well and took on no water at all. Even if it would have, there is a drainage system built into the detachable seating design. I had done a complete 180 on the the UltraSkiff 360. I was not forced to drink "the Kool-Aid" and had no prior affiliation with Jeff or his company. As far as my misconception about loading and unloading, I helped Jeff load the skiffs into his truck. With a strategically placed rubber bumper, numerous strap guides, handles under the flare, and a tow ring I quickly realized that the boats loading and unloading can be accomplished with one person. It was a great day, the skiff was a pleasure to fish out of and I made a new fishing friend. I'm a believer, inshore. Now, offshore is a whole different story! Watch the Video of our day with Paul below! Got my boat this past Tuesday. AWESOME!!! Fished that night. Took a minute to get use to it like the first time I got in a kayak but it ROCKS! Very satisfied. Posted my pics on my Facebook page and got a lot of likes. I think I have a few of my coworkers seriously interested. The want a test drive so we will have to do that soon before it gets to cold here. Here's a few pics. Do what you want with them. Thanks again. May even order one for my wife next summer. On the bottom of the boat there are 4 round molding impressions with screws in the middle. What are they for? I have been meaning to write something about the Ultraskiff but I received mine late in the season and I have been on the water enjoying the end of the fishing season here in Colorado.I keep a pontoon boat at one of the marinas here in Colorado during the summer (June 15 – September 15th) and was in the market for something to use on the reservoir before and after the marina season. I spent a month reading reviews and going to the big box stores looking at inflatables, kayaks, and other small hand launch craft to fill my need. I am a spin caster and I found all these craft to be too close to the water to accommodate my style of casting. I occasionally fly fish and again found the inflatables awkward. I am not saying you can’t as I see people doing it on the lake but it looks and seems awkward. To make a long story short I could not seem to pull the trigger on an inflatable. Then my wife’s brother-in-law sent me a YouTube video of the Ultraskiff. I recognized the potential and called immediately. When I realized I could pick up a pedestal in Texas I was on the road and have never looked back. The Ultraskiff is exactly what I was looking for. Sitting in a normal boat chair allows me to cast comfortably and the 360-degree swivel allows me to cover a lot of fishing territory with ease. Launching and recovery is accomplished with my ATV trailer and rolling the Ultraskiff up and down the ATV ramp is a breeze. I have two eyebolts on the trailer floor positioned on either side of the Ultraskiff that I run a quick strap through for hold-downs. I wear a pair of waterproof ankle boots for launching. The Ultraskiff floats in a few inches of water and I just step into it and use the oar to push me out a bit where I can lower the trolling motor. This means no uncomfortable hip waders. The Ultraskiff is pretty quick with a 55 pound thrust motor and I have motored around my lake and never had a problem with charge. The circular design tends to make the trolling motor a bit sensitive but you quickly adapt. I have found the Ultraskiff to be stable while sitting in the chair. Boat wake and waves are not a problem. Being in my later years now I did find standing up a bit unsteady but I can attribute that to my stiff joints and slow reflexes (and my fishing medicine.) And the Ultraskiff also has a holder for your fishing medicine. The design of the Ultraskiff allows for a certain amount of customization using PVC or other suitable materials. I built a small table to fit in one of the rod holders to hold my lures. The three compartments in the floor of the Ultraskiff as more than adequate to hold your gear, anchor, or whatever you need for your outing. I have found the Ultraskiff to be well-designed and well thought out. If you are in the market for a hand launch fishing platform check out the Ultraskiff. You won’t be disappointed. James is a much smaller person than I so the 360 worked well for him. I am 260lbs, 6'3" and 62 yrs old so I expected the 360 to be more difficult and unstable for me. Boy was I surprised. Remember we have purchased other small boats before. These have worked well for us with a few issues. Most were unsafe for anyone over 200lbs. Very difficult to move around with one person. The 360 just blew my mind. First was the entry into the skiff, the 360 dipped a little but felt stable and did not jump away from the dock. I sat in the seat for a while just talking with James and trying the balance by leaning over the side then bravely kneeling on the side and reaching out as far as I could. I was amazed that the 360 only dipped another couple of inches down and did not even come close to feeling like you were going to get dumped into the water. James gave me a couple of good pointers not to oversteer and how to manage wind positioning. I took a good lap around the cove, gave it good spin each direction, stood up and cast a few times, tried a couple of hard hooksets, spent time keeping position around the shoreline for casting, went wide open for a while, and finally with smile on my face returned to the dock. I am sold on these for lots of reasons: maneuverability, storage, weight, center of gravity, flexibility( saltwater or freshwater rigging, etc ), noise level-almost none, ease of loading and unloading, accessories, well you already know all this but I did not. I am very grateful for you arranging the demo with James. It just could not have been a better experience with such a great man. I will register it here next week and plan to be in an upcoming fishing tournament in it. Keep in touch and I will too. I’ve taken the boat out quite a few times and I love it. I did a couple things slightly different and trailer is definitely the way to go. I don’t think you emphasize that enough. Having all of your tackle in the boat already and being able to slide it into the water is huge. I tried the tow hitch luggage rack thing at first and it worked but it was a little bit of a work out and becomes a little tougher if you’re trying to get off the water when a bunch of others are as well. The skiff is amazing. I love it. it’s perfect for me as I don’t want to the hassle of having a boat and maintenance but still wanting to be on a boat. The UltraSkiff is a 360° fishing platform... I have the opportunity to go out yesterday and fish in the Indian River Lagoon with one I was very pleased with the results...The UltraSkiff allows you to have 360° of fish ability with a very comfortable experience... The hatches are key to having the deck clear of debris...The Rod holders behind the seat allow you to never have to move a fishing rod during a fight ...The Ultraskiff is also very easy to load and unload at your destination... Perfect for short trips in the lagoon or if you live on a freshwater lake or pond this is something definitely for you. Yes we were able to pick up the boats, they were going to be delivered Monday but we had the weekend off so we picked them up Friday. We had an absolute blast out on the water. Again, we both had such a great time out on the water. I am planning a salmon and steelhead trip with some buddies. We got lots of strange and inquisitive looks from people this weekend and we couldn't help but brag about your product. As Elizabeth and I have been telling people about the Ultraskiff, it would be great if we had some cards we could hand out- if you have some send them our way. We want to support your business and see your product take off! It has been a great pleasure working with you and I intend on keeping in touch and following you on Facebook. p.s. I did have one question, is there anybody else with an Ultraskiff in the Northwest or am I the first? Thank you for all the emails, communication. We absolutely love the boat and will enjoy it for a long time!!! It has been about 6 months since I first got my Ultraskiff, I go out at least once a week and I love it more every time. The most intriguing part about this skiff is that it makes even the toughest spots fishable, the 360 degree motion and sturdy hull makes fighting and controlling fish very easy and comfortable. The versatility of it is unmatched by any small boat and makes it feel as if your on something much larger. This initiative product has every aspect that I ever felt was missing while using a kayak. Can't wait to see what Ultraskiff has in store for the future. My wife and I have been fishing in our ultra skiffs for several months now and love them more with each outing. We've developed a way to launch them off of a lowboy trailer on a boat ramp that makes it so easy to get on the water in a matter of minutes. There is so much easily available storage space with the three wells so everything is right at your finger tips. Overall are skiffs are so much fun to fish from, when we are not on the water we are planning our next outing. I would recommend the ultra skiff to anyone who loves to fish. I finally got a chance to get my skiff on the water today. Let me tell you, this is probably the best invention since sliced bread and beer in can!!! The design is great, the balance was great, it was super easy to maneuver across the water. I give it two thumbs up on ever aspect I can think of, and my buddy gives it another two. THAT 4 THUMBS UP! i hooked up on three fish with in 30 mins. And I'm confident I will slay ducks out of this thing the season. The skiff is a must have for any outdoors person, fisherman, waterfowl hunter, and probably more things than even I can think of. I will certainly but showing this thing off as much as I can. Keep up the great work and I'm excited to see what other products you guys come out with next. I got the boat registered, outfitted and in the water last week. Thought I would give a brief report. I am using the Minn Kota Riptide 55 with a 29C Everstart. Like most things boating, this turned into an adventure, more on that later. 1. The FUN factor! Once seated in the center mount captain chair and underway, there is a perspective that is quite different than most small boats. It is not at all like most boats where you are "riding in the boat", you ARE the boat. The experience, especially with the quiet motor is so intimate with your surroundings you might forget that the boat is there. This feeling was more intense than expected. It is similar in that respect to a kayak or canoe in quiet waters, but in a MUCH more comfortable sitting and observing position. 2. The "fishability" factor. The 6' diameter seems just perfect. Large enough to give a very stable and safe feeling when seated and small enough to keep everything available and accessable when needed. uphill) and launching from our dock ﻿was a non event. The smallest trailer can haul one or two around easily with any vehicle. Just to let you know I've used my ultraskiff several times in Lake Conroe and several ponds (tanks) around the area. It's been great and have caught several fish from it, no problems what so ever. My first experience with the ultraskiff was somewhat different than in a Jon boat or any other water craft I've ever been in. I learned very quickly that the boat being round, it will turn on a dime. This was great because a lot of times your fishing hydrilla beds or tree (brush) lines that are irregular shape and you are able to maneuver this boat right into these areas and fish and not be compromised by having a larger boat. That was to me a plus because your fishing areas that don't normally get fished and these areas definintly hold fish. I have a 38 pound thrust motor guide that works fairly well, but I intend to get a 55 pound thrust Minn Kota soon. My motor guide is a little slow and I feel the need to get to the fishing areas a little faster. My plans are to use the Ultraskiff in salt water soon in the Galveston and Christmas Bay area. I have already plotted areas to go to and have located several areas I can launch from. I am very excited to explore different areas to fish, it just the time now is deer season and it limits my time on using it. I hope to bring you an update on my use of the Ultraskiff and pictures of fish as soon as Deer Season is over. You know when your retired you've got to have priority's. Hunting and fishing are my priorities. I have had the Ultraskiff 360 for a while now in Texas. I have used it both in Salt water and fresh and caught fish in both . I can’t wait to try it duck hunting this winter. It is very easy to get around the lake in and maneuver. I get lookieloo’s everywhere I go. My wife has affectionately named it “Dunkin” my fishing donut! I take it every time we go to the lake house on lake Livingston and I don’t need a trailer. I love all the compartments and places to hold gear. It really makes it handy. I use the Basspro tolling motor and it works awesome. I am a bigger guy and it pulls me around just fine. I wish I would have bought two so my wife or buddy can go fishing with me that is my only regret! Great invention and very handy! My story started when my wife told me to take a look at this boat on Face book, “what an interesting boat I got to have one” I told her. We were going to Florida for a while and after we arrived at our RV Park I made and arrangement to meet Jeff so off we go had a little trouble finding him, anyway we pulled into his driveway and there they were little round boats after a lot of begging we were able to take one home. When we got home I carried it up to a little creek not far from home while on the water a Corp Fellow seen it while crossing the bridge and said to himself what in the world was that odd looking contraption, then about the time he walked down to the dock another fellow came down asking what it was I riding in, before he left he invited me to bring it to Ashland City, TN Summer fest in late June because he was in charge of the parks dept., that has come and gone. I handed out flyers, and had a lot of interest, I enjoy showing these boats and telling people that you can customize these little boats just about any way you want, but never drill any holes anywhere. Back to customizing the boat, I built a rail for my fish finder to set about 2 ft high made it easy for me to read, then added a plastic box to put power outlets to plug in my fish finder and my aerator in all 12 volt by using 1 1/4 inch PVC and adding some plastic tape so it will fit tighter, for duck hunters buy three ten ft pieces of 1 1/4 PVC cut them in half buy some camo netting rap around the PVC fasten to the pipe later on I may build one and take pictures, maybe Ultra Skiff will post them.